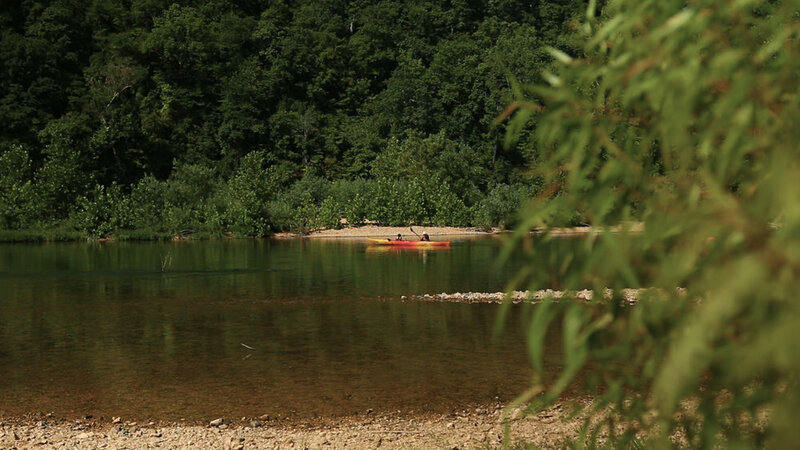 My Ozarks is a collection of short documentary films: intimate portraits of real people, places and experiences in the Ozarks. Our goal is to increase interest in the Ozarks and expand cultural and ecotourism to generate economic opportunities for artisans and entrepreneurs across the region. 6-year-old Camden and his little brother, DJ, carried a lot of boards helping to rebuild their grandmother and great-grandmother’s homes after the 2017 floods. The family epitomizes the town’s collective experience: gut-wrenching loss; neighbors helping neighbors; a sense of community; an arduous and expensive road to recovery, far from achieved; and an unflinching love for the cause of their grief - the river. Camden’s family. Photos provided by Christian Luye. Quinsonta Boyd is a young independent cinematographer and graduate of Roosevelt High School in St. Louis, Missouri. Quinsonta’s passion for film led him to create a short documentary represented in the St. Louis Filmmakers showcase in 2013. Since then, he has done work with organizations such as St. Louis Artworks, the Scholarship Foundation of St. Louis, Nine Network, St. Louis Science Center and Speak Up Productions. Sean Loftin spent eight years as a photojournalist for newspapers and eight years as an elementary school teacher prior to working as Director of Photography for Speakup Productions and starting his own video production company in 2015. He believes stories are abundant in every community and seeks to connect with people who might not otherwise be heard, to understand and help share the stories most important to them. The rising water shocked everyone. Predictions called for the Current River to crest at 32 feet, which in itself seemed unbelievable, three feet higher than the long-standing 1904 record. Like hundreds of other dwellers in Carter County and across southern Missouri, members of 6-year-old Camden Wilcoxon’s family were totally unprepared to lose nearly everything when the river instead rose to a devastating 37.4 feet. It crested in the middle of the night on Sunday, April 30, 2017. Camden tells his flood memories in snippets: seeing a speedboat on a downtown street; helping to carry belongings from the house to the car; and watching his grandmother cry while water was rising into her house. This four-generation Van Buren family – Camden and his two younger siblings, his mother, grandmother, and great grandmother – were impacted in unforgettable ways that haunt and hinder them more than a year later. The children were traumatized, and now “any time it rains, they think it's going to flood,” said their mother, Paige Wilcoxon. The family epitomizes the town’s collective experience: gut-wrenching loss; neighbors helping neighbors; a sense of community; an arduous and expensive road to recovery, far from achieved; and an unflinching love for the cause of their grief - the river. On that fateful weekend, Camden’s great-grandmother, Rosemary Lumsden, 84, listened to the radio all Saturday night. Neighbors living downhill were moving out quickly. “They told us the water's at 27 feet now and it's going to get up to 32. Well, this would put it right at the level of my yard,” she said. However, early projections were inaccurate, and updated predictions didn’t reach local officials, says Carter County Emergency Management Director Curt Majors. That’s because internet and cell service failed during the night. They didn’t realize the true height of the water until Sunday morning. By then, Van Buren’s downtown and houses on low-lying streets had gone under. Despite that, Rosemary and her daughter Cathie Wilcoxon (Camden’s grandmother) thought their houses, on higher ground, would be fine. Then, around 9 a.m., they were told abruptly to evacuate. “I still had the radio on when the guys came across the yard and said, ‘You got to get out, now,’" Rosemary said. Camden’s little brother DJ, age 4, was sitting on the front porch with Rosemary. He turned to her and said, “Granny, I think we're having a disaster." The National Weather Service reports some areas had up to 12 inches of rain in a 48-hour period. 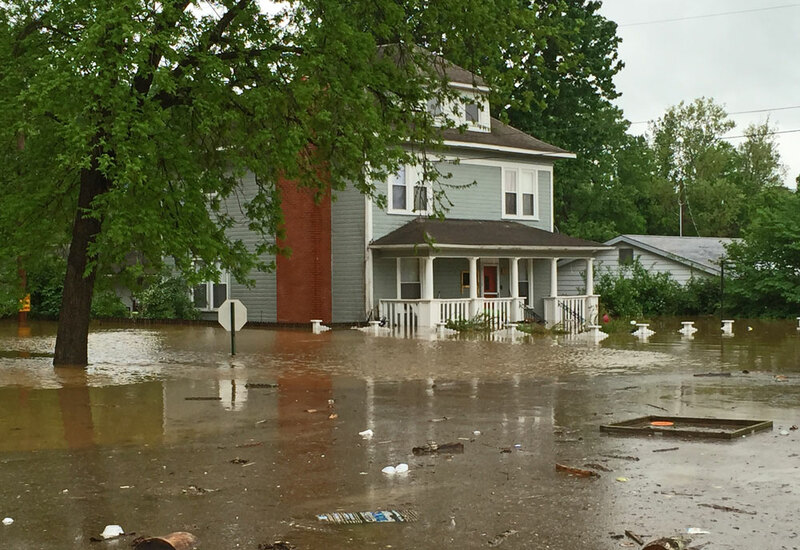 River levels in certain parts of southern Missouri met the agency’s definition of a 500- to 1000-year flood, and communities along waterways in all the surrounding counties suffered great losses. “I guess it was just like a wall of water,” Rosemary said, “because it came suddenly. I only had at most an hour and a half to get stuff out.” She grabbed clothes and put them in a trash bag. She started carrying her tax records upstairs, but ended up losing a lot of them because “I don't climb stairs too fast.” Meanwhile, DJ, still on the porch, was singing, “Row, row, row your boat, gently down the stream." “The flood took my favorite book,” Camden said. DJ’s toy motorcycle floated off, but a neighbor waded in and rescued it. Looking toward downtown, they saw a room-sized freezer from G&W Foods bobbing by. “Everybody's belongings, the trash cans and everything were floating down the river,” Rosemary said. “Pretty soon, it's over my fence. It's going in my front door.” Then she couldn't see the front door, and then the back of the house disappeared. DJ said to Rosemary, "This is what a flood looks like, Granny?" Van Buren hosts the headquarters of the Ozark National Scenic Riverways, a national park that protects 134 miles of the Current and Jacks Fork rivers. Campgrounds, visitor centers, and access points along the two rivers were badly damaged by the flood; many of these were closed for extended periods. 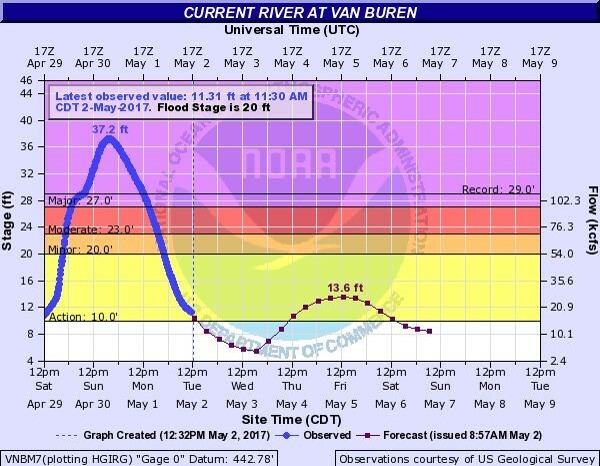 The Current River attracts more than 100,000 floaters per year in the Van Buren area alone. Workers from around the county fill about 800 seasonal jobs to serve tourists. Thirty-eight Van Buren businesses were virtually destroyed that spring. Losing critical businesses right before float season intensified the economic misery. Four restaurants, the grocery store, a bank, the post office, the phone company, a funeral home, plus four canoe outfitters and campgrounds were among the businesses submerged. Further, the courthouse, jail, sheriff’s office, and police station were closed indefinitely, along with the city’s riverfront parks. The flood stole their photo memories, wiped out all but the shell of their homes, and left overwhelming messes. “I didn't know how it turns everything over,” Rosemary said. “I just thought the water comes up and everything will be wet.” Instead, they had to clear out jumbled-up tables and chairs, overturned refrigerators, and sopping wet couches (impossibly heavy), with everything covered in a layer of wet silt. Despite overflowing emotions, this family, and all their neighbors, had to launch Herculean clean-ups quickly, throwing out floodwater-contaminated treasures until big piles of debris grew next to the curb in front of each house. They were in a race against the black mold that grows almost immediately, making an entire house unsalvageable unless it’s stripped to the studs and fumigated within a few days. 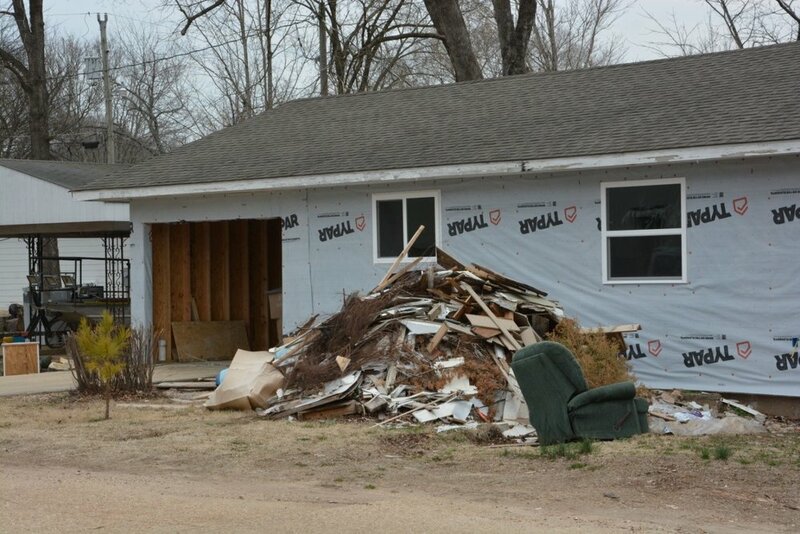 Mercifully, armies of energetic volunteers descended, not just in Van Buren but throughout flood-ravaged Ozark communities, tearing out sheet rock and insulation, thus saving hundreds of structures. Other outside help came. Several corporations and regional churches sent food and bottled water. Convoy of Hope brought in cleaning supplies, tools, trash bags and snacks. “This town pulled together so much, people helping people,” Cathie said. A big part of pulling together meant reopening the town’s economic base. One riverbank resort, The Landing, invested heavily in cleanup and remodeling. Within six weeks they were ready for much-needed tourists. Despite heroic efforts to reopen, visitors stayed away that summer. The resort had to lay off workers due to a lack of business. 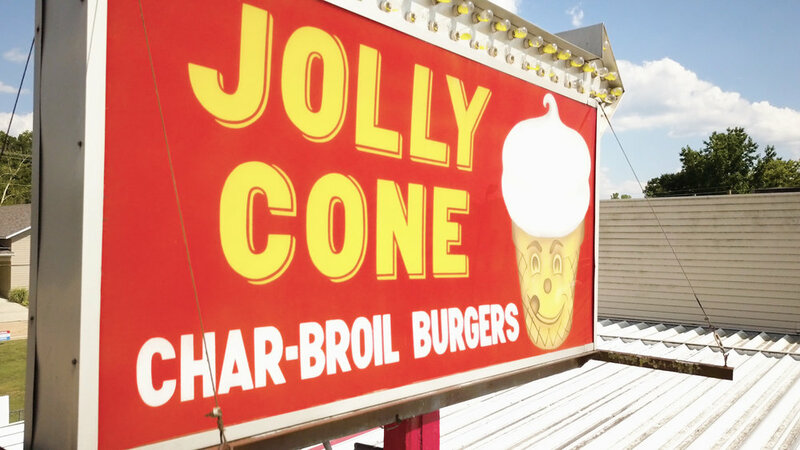 More than a year later, popular restaurants Jolly Cone and The Float Stream and nearly 20 other businesses have reopened; some relocated. The post office has been rebuilt, as was the elementary school and high school gym. But many other public facilities are still in temporary buildings. The Carter County Courthouse, flooded 5.5 feet deep, has become a de-facto symbol of frustration with the slow recovery. Townsfolk are passionate about restoring this iconic rock structure, but high projected costs and bureaucratic tangles have thwarted repairs. FEMA eventually determined that it would only fund a new courthouse on higher ground. As of fall 2018, the old courthouse’s fate was still uncertain, but there is talk of holding fundraisers to repair it, regardless of whether it becomes the official courthouse again. The regional planning commission wrote a flurry of grants to help local governments recover, but many are still waiting for approval. So far, they have secured money for debris removal and for flood buyouts on 23 properties countywide. Rebuilding private homes has also been cumbersome. Van Buren’s population is only 800-900, yet about 280 houses were heavily impacted. Many ruined houses have been abandoned or torn down, and the owners moved away. FEMA money, once the townpeople’s great hope, was a disappointment. Many people had no flood insurance, and even those who qualified found that their payments were much lower than anticipated. A long-term flood recovery committee is helping owners return home, house by house. They’re stretching nearly $84,000 in donations well beyond its typical buying power. By cutting deals with building suppliers, soliciting materials, and finding skilled volunteer labor, they have only spent about $30,000 to complete three project houses and nearly complete three more, says Pastor Dave Truncone, the committee’s chairman. Repairs on more homes are expected to start soon. Despite this tremendous outpouring of assistance, only a modest number of damaged homes have been reoccupied, and many people’s needs are still high, more than a year later. Our featured family’s recovery parallels the town’s. Progress happens, but slowly. More than a year later, Rosemary and Cathie have downsized just to get back into livable dwellings. Neither had flood insurance because they were considered to be above the floodplain. Rebuilding costs have been a heavy burden. Rosemary’s house, unrepairable, had to be leveled, so she remodeled her garage into an abode. Camden and DJ helped carry boards as she rebuilt. Next door, standing stripped and awaiting repair is a rental house that had provided Rosemary with retirement income. Cathie’s former two-story home, one of Van Buren’s oldest, is also still a shell, waiting for the time, energy and money to restore it. She is living in a tiny guest house behind her vintage home, which was more affordable to repair. “In every adversity is the seed of an equivalent or greater benefit.” Since the flood, Rosemary has repeatedly reminded her family of this wise saying. Almost perversely, the Current River itself – the cause of so much loss – will be the seed to generate Van Buren’s rebirth, Rosemary says. Locals and visitors alike feel unwavering loyalty to the cold, clear, spring-fed stream. “The river pulls us together as a family and also as a community” said Cathie. “Even though we live here, we go camping and we have cookouts and picnics. Everyone here has some way of enjoying the river.” After the flood, Paige said, she couldn’t wait to get out on the water. Camden and DJ still love to kayak with their granny. “People are going to come to that river,” Rosemary said, and visitors want restaurants, groceries, float services, and more. “This is the reason I think the town is not dying,” she said. “We just want to get it cleaned up enough to accommodate these people. We are rebuilding, but we've got a lot to do, just as a family we do. I have confidence that we will have a thriving town again,” Rosemary concluded. Denise Henderson Vaughn specializes in writing about Ozark forests and waterways. She holds a master’s degree from the Missouri School of Journalism, and formerly covered natural resource issues for the West Plains Daily Quill. As founder of Ozark Enviromedia, she currently assists not-for-profit organizations with strategic communications.